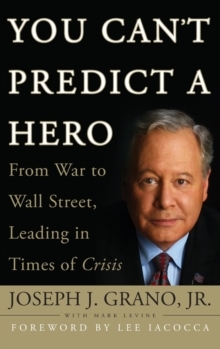 The unique story of Wall Street legend Joe Grano-six defining moments in courage, leadership, and determination that will inspire readers of every age, and at every stage in life From Vietnam to 9/11, from the market crash of '87 to today's financial crisis, Wall Street legend Joe Grano has weathered the most defining crises of the last forty years. Whether leading draftees through combat as a Green Beret in Vietnam, regrouping a team of brokers during the market crash of 1987, or working tirelessly to reopen Wall Street after the attacks on 9/11, Joe has served at the front lines of our nation's most defining moments, leading and even inspiring others when things seem at their darkest. Structured around six specific crises he faced in his life and career, You Can't Predict a Hero will describe how Grano was able to triumph over challenges both personal and professional. Whether teaching himself to walk again after sustaining crippling battle wounds, rising from his hardscrabble beginnings to become a top broker at Merrill Lynch, or shepherding the merger of PaineWebber and UBS, his experience has been hard-won and his perspective like no one else's. Through it all, Grano has learned to find the opportunity in any crisis, how to calm and inspire those he leads, and how to find the real solution to what can appear as an insurmountable problem. This dynamic book will inspire anyone looking to make sense of our rapidly changing world, and how to grow and even thrive through any challenge. Problems require solutions, and crisis creates true leaders. Joseph J. Grano, Jr. is Chairman and CEO of Centurion Holdings LLC, a company that advises private and public companies. From 2001-2004, Grano was Chairman of UBS Financial Services Inc. (formerly UBS PaineWebber). Having joined the company in 1988, Grano is credited for turning PaineWebber around and shepherding its merger with Swiss banking giant UBS. Grano began his career as a stock broker at Merrill Lynch, where he rose to various senior management positions over 16 years. A decorated war hero, Grano was chosen by the White House to be chairman of the President's Homeland Security Advisory Council after 9/11, a position he held from 2002-2005. The recipient of countless awards for leadership, civic contributions, as well as honorary degrees, he is involved in a wide range of educational and philanthropic endeavors. He and his wife, Kathy, live in New Jersey. Mark Levine has written and collaborated on more than 30 books, including the best sellers Second Acts, Die Broke, and Lifescripts, as well as hundreds of magazine articles. He lives Ithaca, New York, and is a member of the Authors Guild.